Our house is built on a hill, so I'm in a constant battle against erosion on the sides of the property. Several years ago, I built tiers on the south side and planted some ground cover and shrubbery to hold the ground. 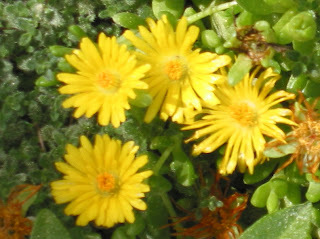 These are the tiny yellow flowers that bloom in one of the sections. I have no idea what it is, but it typically blooms later than the other plants, which is kind of nice. It looks like some kind of succulent to me, maybe Iceplant? I was thinking succulent as well. But I'm not as familiar with them so make a guess from that picture. Is it a Delosperma nubigenum? I just planted what I thought looked nice. The stuff that died got ripped out, the stuff that lived got to stay. Iceplants are so darn cute, with their bright flowers (bright pink, besides the bright yellow, but I'm not a fan of the yellow green ones) and rubbery looking fingers/tentacles.